The president of the SEC, Oliver Derkovski, today assessed that the organization for implementing the referendum on September 30 is running without problems, and that the Commission is sticking to the given deadlines. 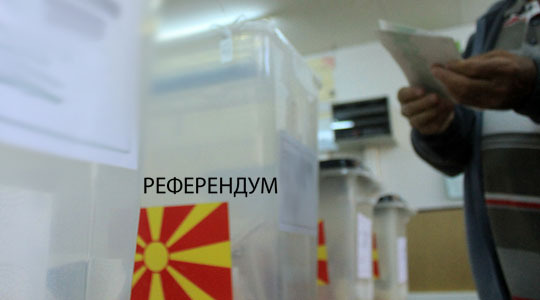 The OSCE Mission in Skopje reacted to the news that some portals published today, and according to which the turnout at the referendum would be “catastrophically bad”. “The OSCE Mission in Skopje is familiar with the recent articles in the media that claim that the OSCE has carried out a survey for the upcoming referendum. The Mission has not conducted such a survey. All findings that claim the opposite are not correct, and do not express the work of the OSCE Mission in Skopje”, is stated in the statement. a panel. Today in Ohrid is German Minister of State for Europe, Michael Roth, who called for using the chance for EU and NATO integration through the resolution of the name dispute. CIVIL – Center for Freedom is completing the project “Patriotism – YES, Nationalism – NO!”, which is supported by the Civica Mobilitas program, implemented by MCIC, and financed by the Swiss Agency for Development and Cooperation. The goal of the project is to contribute to the reduction of the destructive consequences of nationalism and extremism in society and to explain the difference between patriotism and nationalism. Furthermore, the project displays the benefits of strengthening coexistence, improving relations with neighbors and accelerating Macedonia’s Euro-Atlantic integration processes.